This week’s review is going to be a departure for us here at Automoblog. This won’t deal with how well a car deals with the grocery run, or whether it looks good while sitting in the driveway. This is a road trip. This is something special. What kind of road trip is this? Well, it will include yours truly taking a three-day, 1,000 mile round-trip voyage from Columbus, Ohio to Elkhart Lake, Wisconsin, home of Road America. This will be the ultimate test of comfort, control and efficiency. But what should we use for this unique adventure? Maybe a comfortable mid-size sedan? Or how about a new crossover sport-utility? No, this is going to take something truly different. 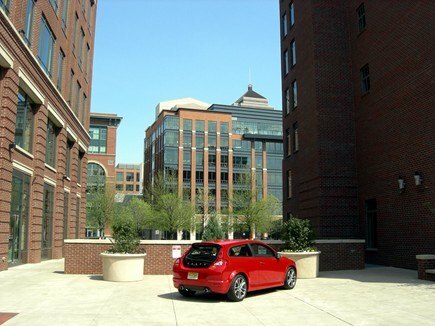 As luck would have it, Volvo supplied me with the right vehicle that would complement this unique trip: A 2009 Volvo C30 R-Design. As our long-time readers know, our fearless leader Chris tested a Volvo C30 last year, and was not a fan of it. He could not get past the styling and his car suffered from a serious electrical glitch. Would I end up in the same predicament? When the Passion Red two-door arrived, I was a bit skeptical of this somewhat “in-your-face, back-to-the-old-days” styling. The clean and crisp front-end comes from the S40 sedan and V50 wagon, which the C30 shares its platform. It does away with the box-on-wheels of Volvo’s past and incorporates a smaller grille as well as rounded fenders with a subtle flair above the wheels. But the other end of the car is what will grab your attention. Gone is your typical sedan trunk or wagon box. The C30’s modern design is in full effect. From the front to the rear, the waist line bends upward as well as pulled in towards the centerline of the vehicle, creating these curvaceous hips that bring a strong whiff of P1800 to your eyes. The roof slopes up from the front then down slightly in the rear to a larger spoiler and all-glass rear hatch. The taillights traveled from the spoiler down into the rear end and push out into those wide rear fenders. With the top-ranged R-Design package consisting of a monotone paint scheme, ground effects all the way around and designed eighteen-inch wheels, the 2009 Volvo C30 R-Design will certainly have you doing double-takes. Andy Warhol-like pattern to it. The seats in the R-Design come with their own special two-tone black leather and white Flextech, a material designed to resist fade and damage from Mother Nature, which are imprinted with the R-Design logo. Motivating this little sport hatch is Volvo’s 2.5 liter, turbocharged inline-5. It has been around for a while and now makes 227 horsepower and 236 lb. ft of torque on premium gas. Transferring this power to the ground is Volvo’s five-speed automatic, with Geartronic auto-manual controls. The first half of my excursion would take me west on I70 towards Indianapolis. A quick jaunt around Indy I465 would lead me north on I65 straight through Gary. 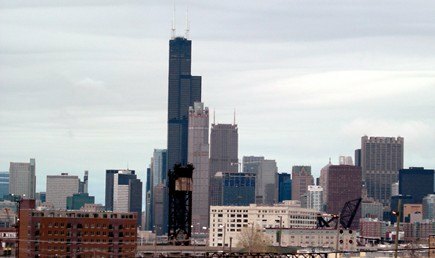 Hop on the Chicago Skyway and coast through Chicago on into Milwaukee. Then it would be a straight shot up Route 57 to the racetrack. The weather was predicted to be nice, and traveling during a weekday would leave traffic less hectic, leaving me time to enjoy the drive and take many photos along the way. However, I think the gang from Top Gear would best describe this impending trip: Ambitious, but rubbish. It was mostly sunny in Columbus on Tuesday morning. I had my luggage secured below that big rear window, the AAA TripTik in the passenger seat ready to lead me to my ultimate destination, almost 530 miles away. 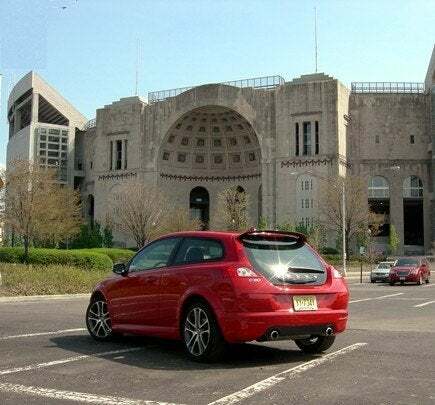 I started my trip around the sprawling campus of Ohio State University, one of the largest universities in the country and home of major sports venues such as the John Schottenstein Arena and, of course, the Horseshoe. Luckily for me, it was the off-season, so I had the perfect opportunity to travel around and check out the campus before hitting the road. Pulling onto I70 W, I got the first opportunity to use all 227 horses to accelerate ahead of a tractor trailer that refuses to move into the center lane. 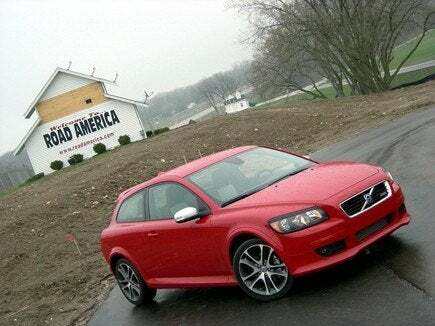 The 2009 Volvo C30 R-Design’s five-cylinder does not pull quite as hard as a Mazdaspeed3, but the five-speed automatic kicks down quickly to put you in the right gear for maximum pulling power. And boy, does it sound terrific doing it, emitting a deep throaty roar from the exhaust. Once down to safer cruising speed and putting some miles between me and Buckeye Country, I quickly realized two potential issues. One was the dark clouds rapidly approaching over the horizon in front of me; the second one was how unbelievably flat and boring this stretch of road seemed to be. Sadly, both became a reality just outside of Dayton. The skys opened all the way to Indianapolis, which cut down on any outdoor activities, and flat farm land surrounding me at every viewpoint, it gave me a chance to become a bit more familiar with the C30’s interior. I liked many of the interior treatments in this car. The cool two-tone seats were providing good support for my back and hips, and the HVAC was doing a good job keeping me cool while keeping the windows from fogging up. The thick-rimmed, R-Design wheel felt perfect in my hands, with these two small extensions for your thumbs which were a nice touch. It is quite roomy up front too, and there is adequate room for two people in the second row. Trunk room is snug though, with the steep rake of the rear end cutting into valuable storage room. One thing kept nagging me though. Where was the style, the look that matches the exterior? There are wonderful materials throughout and the dash carried the stigma of Volvo efficiency, but it just didn’t make a style point like the exterior did. Just outside Indy, the rain dissipated enough for me to find my way onto the 465 beltway. However, traffic had picked up and my paced had dropped. Frustration was setting in, only a few hours into the calculated nine hour drive. To take my mind off things, I turned on the optional Dynaudio upgraded sound system to see if I could find something to listen to. 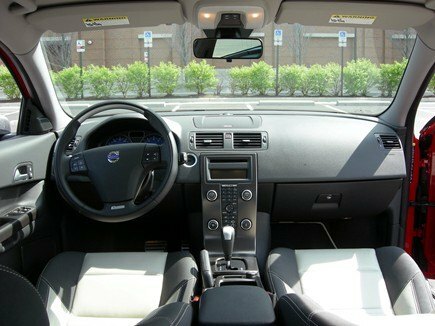 Lucky for me, this 2009 Volvo C30 R-Design comes standard with Sirius satellite radio. Turning to Classic Vinyl on channel 14, I found the 360 watt, 11-speaker a bit flat. Thankfully, this system, with Dolby Pro Logic II surround, had an adjustable five-band equalizer for both front and rear speakers. A little tweaking and I had CCR flooding the car with a rich, deep sound. Finally relieving myself of traffic, I made my way onto I65, which would take me right into Chicago, and would make me lose my mind. Now, I have no problem with the state of Indiana. I like downtown Indy. I respect the Indianapolis Colts. But is this state mind-numbing to drive through. I thought my trip from Columbus was bad, this section is downright torture. As far as you can see, (and you can see for miles in some places) there wasn’t anything to actually witness. No trees, no tended farmland; just flat land and straight highway. 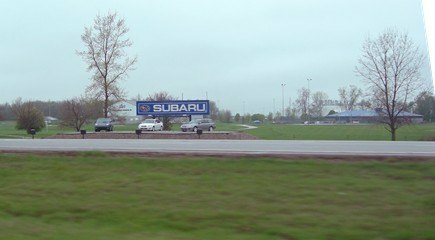 The only saving grace was seeing the Subaru plant, and I almost missed it. Oh, and the rain started again. Can you see me smiling through the smeared windows? Thankfully this car has the optional automatic wipers that actually worked when it was raining, and their sensitivity was adjustable as well. Not helping was the ride of my C30. On smooth asphalt, it was as quiet and comfortable, but rolling down the pock-marked Indiana highway, the Pirelli PZeros drone loudly. The suspension was absorbing the smaller potholes pretty well, but bigger ones would cause the front suspension to crash and jounce, sending wave after wave into my seat. The R-Design comes standard with what Volvo called Dynamic Chassis. The suspension tuning offers a stiffer spring and dampers as well as thicker anti-roll bars. While I applaud the R-Design for handling tight on-ramps with tons of grip and flat cornering, it’s not enough to compensate for the harsh ride. Merrillville, Indiana outside Gary is when I give myself a break and took care of the lighted gas pump symbol glowing from the dash. The rain is still falling, but that’s not what I am concerned about. An older gentleman in a Bentley Flying Spur sedan pulls up behind me while I’m topping off the 15.9 gallon tank with fresh premium. I’m not so much focused on the car as I am the driver, who has stopped talking into the cell phone stuck to his hear to stare at the C30’s design cues. Then I noticed a woman filling up her Ford Focus giving the car a once-over as well. This car seems to be a real eye-catcher. Back on the soggy road, I began to think about the design. Did I like it? Was it too much? I thought it was a damn good-looking car. I love the uniqueness of the rear, without being overdone. It was graceful, yet striking. That small window was actually useful to load the 12.9 cubic feet of trunk space as well as reach the rear seats to fold them down. The chrome exhaust tips brought a more upscale touch. Not too much, but just right. 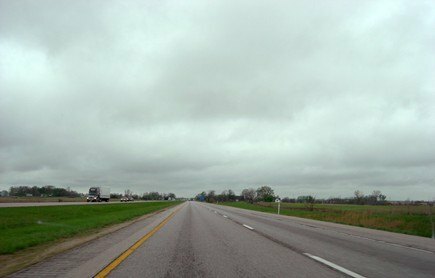 The rain ceased as I crossed into Illinois, and the clouds began to part. It looked like my trip was finally making a turn for the better. Unfortunately, the joy was short-lived. Just a few miles after the bridge, I was greeted by the Windy City with a four-mile long traffic jam. That added an extra hour to my trip, but at least I got a lovely view of the Sears Tower. Traffic thinned enough for me to make it to the northern suburb of Winnetka, where I had an early Chipotle dinner with an old fraternity brother. Six hours into this trip and I still didn’t feel any physical pain, nor was I even hungry, and I\’m always hungry. 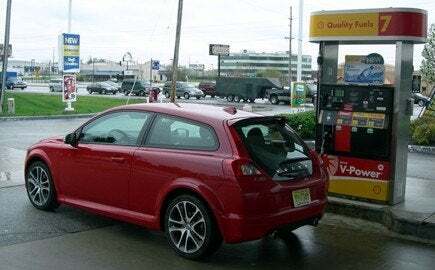 Could the 2009 Volvo C30 R-Design have pulled off a magic trick where I didn’t dispel any energy? This trip is getting stranger by the hour. I left my friend and began to enjoy the wonderful road construction that has consumed most of I94. Here, the stiff suspension reared its ugly head again and began pitching the car. Every heave and dip turned the little Volvo into a bobble-head convention. 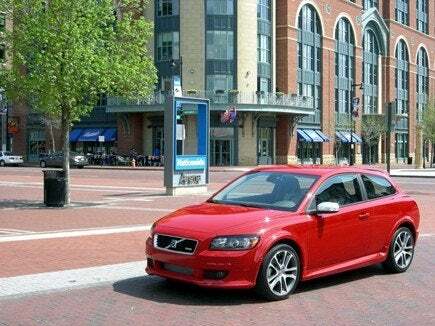 As I entered Milwaukee’s smoother roadways, my fondness for the C30 started growing again. I love the right amount of power and sound coming from the engine. The just-right size let me squirt around slower traffic, even if the steering wasn’t as sharp as I like. I appreciated how the controls for the radio and ventilation were laid out in an easy to use manner. The gauges and handy trip computer were read at a glance, even though the blue faces didn’t match anything else in the car. After yet another boring stretch of highway called Route 57, my destination thankfully appeared out of nowhere, shining like a bright beacon calling me to keep going. 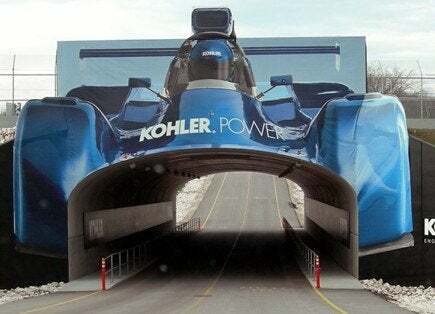 Its sedate front offices would have been passed had it not been for the large Kohler race car leading to the paddock. Nine hours and 531 miles from Columbus and I made it. My little Volvo survived the trip unscathed. Outside of the ride, I felt little to criticize after my extensive trip. The seats gave me no aches or pains, and I felt physically ready go to while my brain was ready for sleep. I averaged 26.5 miles per gallon, which is quite good considering it’s a forced induction engine with an automatic. But it was late and I had two long days ahead of me, so off to the Days Inn in Sheboygan for some much needed rest. After two days of flying around Road America’s four miles of racetrack at insane speeds in cars you could only dream about (you’ll read about it all in future articles) and passing out business cards to PR people and fellow journalists, it was time to head back home. Rain, my old nemesis, appeared early in the morning and kept me company the first half of the trip. But it was accompanied by its cousin no one likes, Fog. Luckily, the C30 R-Design comes equipped with front and rear fog lamps, the latter came in handy on more than one occasion. On the way back, I followed I-41 down to I90/I94. But instead of going back through Indianapolis again, I took Route 31 across Indiana into Ohio and down Route 23 into Columbus. Figured it would give me something else to look at. At least I had hoped. 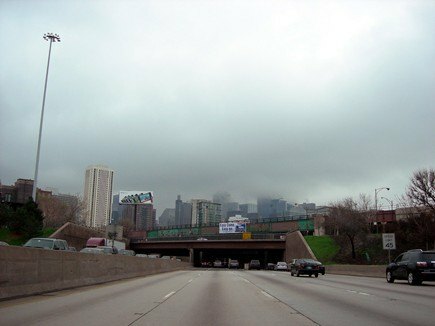 Milwaukee and Chicago were encased in fog, the roads were soaked and every single person decided to hog the left lane. I was happy to get off these interstates and enjoy a slower paced back road. There were several stoplights on this stretch of the trip and it gave me a chance to really test the brakes, and goose the engine some more. While the brakes had a surprising amount of travel before they bit the rotors as well as being somewhat soft, they were reassuring and quite strong, even after multiple full-panic stops. Only once did the ABS engage. Did that engine note sound good. On the flip side, there were a few apparent design flaws. The minor ones were the poorly placed ignition slot, which may have been useful if it weren’t stuck behind the windshield wiper controls. On the passenger side, the raised door sill actually chopped off the bottom of the mirror, which greatly threw off my depth perception. But the big issue was the cause of cool design. In the rear, those tucked in body lines and flared rear fenders created a massive B-pillar, which caused a terrible blind spot over your left shoulder. Even looking over my shoulder and using the mirror, I ended up cutting off more than one person in my travels. I learned quickly to be careful. After making it back to Columbus, I was sad my journey was over. Not because I enjoyed driving in the rain so much or the fact that the Midwest is the most boring part of our country, but I really enjoyed this Volvo. It may not be the sportiest car in its class, and it’s certainly not cheap, but it was comfortable, fun to drive at 8/10s and it looks great. I had zero problems with the car and it loved the open road. And when you’re out there in your C30, you’ll be in a rare club, since I only laid eyes upon one other C30 during my entire trip. Hope you like the attention. We trust Edmunds to give us the best, up to date, and TRUE pricing of what people are really paying for their cars. Get a free dealer quote at Edmunds on this car. 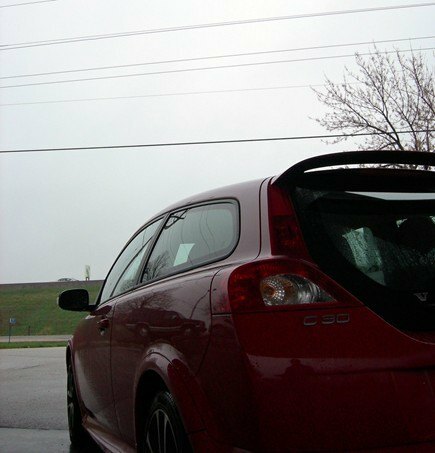 No Comments on "2009 Volvo C30 R-Design Review"